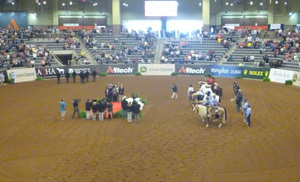 Home › Blogs › SmartPak Features › USA Wins Team Gold! It is always great to win, especially when you know that you have competed and done your best against the best in the world. 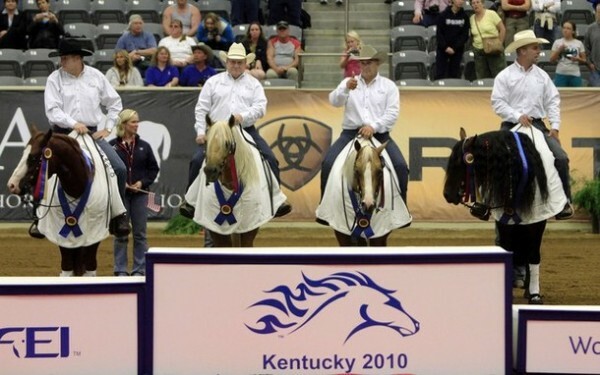 It was a great day for everyone on the USA Reining Team. Tom McCutcheon started things off for the Team in the morning section by laying down a blistering 224 with Gunners Special Nite, owned by Sarah Willeman and Turnabout Farm. The score tied them with Italy’s Stefano Massignan and Yellow Jersey, owned by Arcese Quarter Horses. Those would stay at the top of the leader board until Shawn Flarida and RC Fancy Step entered the arena. Flarida piloted the Buffalo Ranch owned RC Fancy Step to a massive score of 227. The scores to follow were strong but not enough to catch the United States. The final results, Team USA with the Gold, Team Belgium with Sliver and Team Italy with the Bronze. With such an impressive showing in the Team competition, we are assured of an amazing Individual Final on Thursday. The top 15 from the Team Competition advance to the Individual Final on Thursday; along with the top five from the consolation round to be held on Tuesday. It was amazing to watch Team USA win its third consecutive Gold Medal. The competition was strong but Team USA proved without a doubt that they were up to the challenge. The press conference was pretty funny as one journalist asked the guys if they felt the extra weight carried by the US riders was what gave them the added edge. This is apparently an old favorite of the media as it has been asked at both previous World Equestrian Games press conferences. Chef d’Equipe, Jeff Petska, was ready for them this time as he calmly answered, “We brought a bunch of heavyweights to a heavyweight fight. Anybody want to wrestle?” Nicely done, Jeff! Tom McCutcheon got a kick out of it, as he is an avid UFC fan! All of the team members were very eloquent while being interviewed. Tom remarked that he was unsure if there would ever be a team like this again and that he is sure that in 20 or 30 years, he will look back and be able to say that he remembers this team. Tim McQuay was impressed at the overall quality of the competitors and how they had grown so much. He feels that the competition will get stronger and stronger as time goes on. Shawn Flarida said that he couldn’t even hear himself think as he walked into the pen to show and that he just loves to compete. 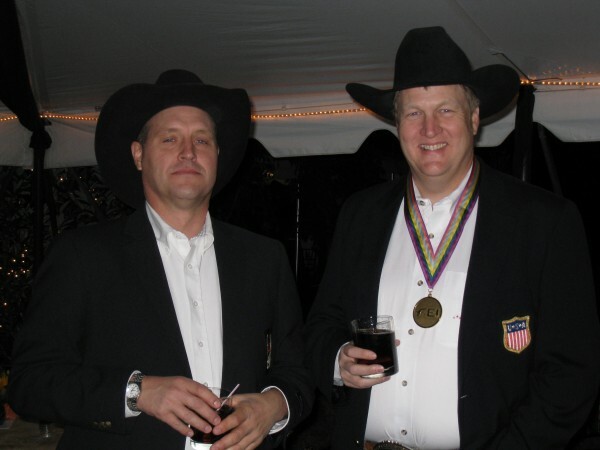 Craig Schmersal was very grateful that he had qualified two top horses, allowing him to substitute Mister Montana Nic as his competition mount when Boom Shernic came up a little sore prior to coming to Kentucky. What is so impressive about these guys is how genuine they are. What you see on NBC’s coverage and read in the press is really what you get with all of them. Monica Hicks, groom for Hollywoodstinseltown and longtime McQuay family friend, still gets choked up when she tells about Tim McQuay tearing up on the medal podium. The sincere joy that they get from being with the horses, representing their country and then winning Gold again is wonderful to witness. Sunday night we were all invited to the American Quarter Horse Association Cowboy Gala, held at the amazing WinStar Farm. The adventure started with all of us piling into Jeff Petska’s rental car and heading to Keenland Race Track to meet the shuttle buses. We loaded into the buses and were treated to a video highlighting the racing success of WinStar as we were taken to the training barn. To say that the facility is impressive is a complete understatement. They have three walkers, a new synthetic footing track, an AquaTred and a hyperbaric chamber! That was just the beginning! We got to visit the stallion barn and were treated to a viewing of Colonel John and Sharp Humor. Larry McGinnis, the stallion manager, was very nice and answered questions from the group. Barb Wibbles, the breeding manager for Tom McCutcheon Reining Horses, and I really didn’t want to leave! It was great. We hopped back on the bus and were taken to the main farm. Absolutely stunning! We were dropped off by the main office and made our way to three large tents. The food was excellent, a great mix of BBQ and sides! The side tent was very popular, with tasting tables from local bourbon distilleries, Four Roses and Wild Turkey, and even a gentleman hand rolling cigars! Bluegrass musicians in each tent provided music and dancing kicked off very early! I was very happy to meet Susan Casner, one of the owners of WinStar. She was lovely to talk to and even invited us to take a tour of the farm whenever we liked. Dessert was served in the office where we got to see the amazing racing trophies that WinStar has amassed, including the trophies from Spring At Last winning the $1,000,000 Godolphin Mile and Well Armed’s trophy from the Dubai World Cup! As we reloaded the buses, we were delighted to receive amazing SmartPak tote bags that were absolutely packed with cool goodies along with a 1/16th scale model John Deere tractor! The bus ride back to Keenland was filled with Tom joking with Duane Latimer and Lance Griffin, of course the rest of the bus joined in! It was a great day and a great night! Thank you to all of the sponsors and to WinStar Farm for welcoming us, we had an amazing time! It is amazing to see the growth that reining and reining horses have experienced across the globe. It is fantastic that horsemen and horses from as far away as Israel came to compete. I’m proud to be a part of an industry that can field such talent at a competition. Teared me up to watch Shawn’s go it was truly a thing of beauty!!! Long Live Cowboys!!!! Good luck in the individual competition. Go USA!!! !